From a statistical standpoint, Bill Parcells is the most overrated football coach in NFL history. On the surface, Bill Parcells stats appear to be pretty solid but a sophisticated look at his career stats as a head football coach in the NFL shows he greatly benefited from the work of another coach on his staff. Who is that other coach? None other than Bill Belichick, the greatest head coach in NFL history. When Bill Parcells was hired by the New York Giants in 1983 to be their head football coach he inherited a young Bill Belichick who was already on the Giants staff as special teams coach and defensive assistant. By the time Bill Parcells became the Giants head coach, Bill Belichick had already been an assistant coach in the NFL for eight years. Belichick began his career in the NFL in 1975 as a special assistant for the then Baltimore Colts. 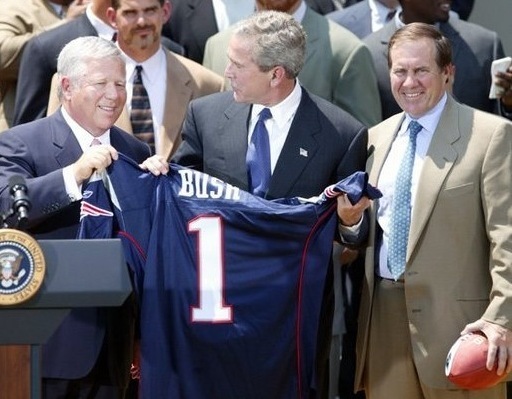 As the numbers below show, Bill Parcells totally lucked out when he inherited Bill Belichick as a NFL coach. Bill Parcells overall record in the NFL is pretty good. That's far from the greatest coaches in NFL history but Parcells did win two Super Bowls and made it to three Super Bowls as a head coach. But take a look at Parcells record with and without Bill Belichick on his staff running his defenses. With Bill Belichick on his staff running his defenses Bill Parcells overall record in the NFL is 128-78-1. That includes winning 11 playoff games, making it to three Super Bowls and winning two Super Bowls. That's a great record that ranks up there with coaches like Paul Brown (.616), Bill Walsh (.617), Curly Lambeau (.623) and Joe Gibbs (.629). Thank you very much Bill Belichick! Without Bill Belichick on his staff running his defenses, Bill Parcells overall record in the NFL is just 55-60, including going 0-3 in the playoffs. So Bill Parcells has a losing record and never won a playoff game without Bill Belichick on his staff. Parcells record without Bill Belichick ranks with other NFL head coaches like Jerry Glanville (.463), Forrest Gregg (.470), Dave Wannstedt (.483) and Norv Turner (.484). Even Rex Ryan at 65-68 (.489) has a better record in the NFL than Bill Parcells does without Bill Belichick on his staff. If you want to get technical here, Belichick did not run the Giants defense the first year Parcells was head coach and Giants went 3-12-1. So without Belichick running his defenses, Bill Parcells record in the NFL is 58-72-1. Now let's take a look at Bill Belichick's overall record as of 1-30-2018. Belichick has already won a record six Super Bowls and made it to a record nine Super Bowls as a NFL head coach. He is the greatest coach in NFL history and it's pretty obvious from the stats above that Bill Parcells overall record as a head coach in the NFL greatly benefited from having Bill Belichick on his staff. The players always knew this. When the New York Giants defeated the Washington Redskins by a score of 14-0 in the NFC Championship game in 1987 to punch the franchises first ticket to a Super Bowl, the players carried Bill Belichick not Bill Parcells off the field. Sophisticated New York Giants and NFL fans also knew this. When the Giants defeated the Buffalo Bills in Super Bowl XXV, the Pro Football Hall of Fame asked for Bill Belichick's game plan not Bill Parcells. Looking over the stats above, it's clear that Bill Parcells was a pretty good NFL head coach when he had Bill Belichick running his defenses and a very mediocre NFL head coach when Bill Belichick was not on his staff. That's why Bill Parcells is the most overrated coach in NFL history. He would never have gotten into the Pro Football Hall Fame without the work of Bill Belichick.